With Gambettola’s close proximity to the sea, we’ve found the marine life, surging tides and the aquatic colours to be a constant source of inspiration. The nearby North Adriatic Coast offers the perfect colour palette of crisp whites and striking sea blues, which are exquisitely reflected in the new Panarea range. The whole stretch of the North Adriatic Coast is stunning, but Monte Conero (with its breathtaking Portonovo bay) and the quaint, quiet beauty of Cesenatico both hold a special place in our hearts. Monte Conero is a distinct limestone peak that touches the sea, where the prettiest beaches on the whole coast exist. The whole of the Conero Riviera is undeniably picturesque but Portonovo has the most character with the Fortino Napoleonico (Napoleonic Fort), evergreen oaks and pristine beaches. Cesenatico offers the perfect balance of history and modernity, but it is the Canal Harbour (designed by Leonardo da Vinci) that is the real talking point. 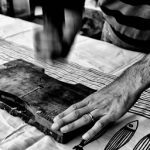 Hand-printed cloth is deeply rooted in the heritage of the area, and the fusion of tradition and contemporary flair that we find in Cesenatico is beautifully realised in the recent Panarea designs. 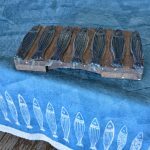 The Romagna coast is famed for its local delicacy, the Adriatic blue fish. This is honoured by the Panarea designs. If you love seafood then the Adriatic coast will taste like heaven to you. 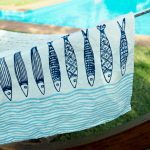 There is an abundance of oily fish that is not only affordable but also incredibly healthy and delicious. 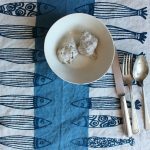 Many of the recipes of the area come from fishermen, meaning they have a subtle simplicity and really allow the flavour of the fish itself to stand out. The perfect example of a fisherman’s meal that has made its way onto the menus of local restaurants is brodetto di pesce (an authentic Italian seafood stew flavoured with tomatoes, garlic and wine). The beauty of all of these dishes comes from the freshness of the fish. There is an abundance of mackerel and sardines in the area which forms the staple diet of the locals. One of the absolute must-have dishes is cartoccio di fritto misto, a package of delicately fried mixed seafood that is mouth-wateringly fresh. It makes the perfect snack to enjoy while strolling through the picturesque harbours and breathtaking beaches of the area. The tradition of stampa romagnola is renowned in Romagna. 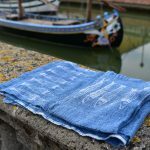 This distinctive art of hand-printing using hand-carved wooden stamps to adorn crisp linens is one that has been passed down through the generations. Gambettola is right in the heart of Romagna, geographically and culturally and the art of stampa romagnola has played a large and important role in the heritage of the place. 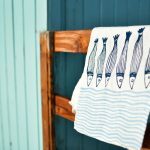 The patterns used in this style of printing tend to reflect the beauty of the area with nautical, coastal or floral motifs. There is often a simplicity and geometric charm to the design, which honours the origins of this tradition. 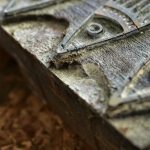 Although new designs and richer colours are now being used, the newer designs show a lot of respect for the origins of this beautiful art form. 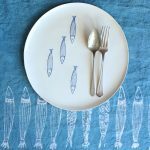 The latest designs from Panarea offer the perfect taste of Romagna. 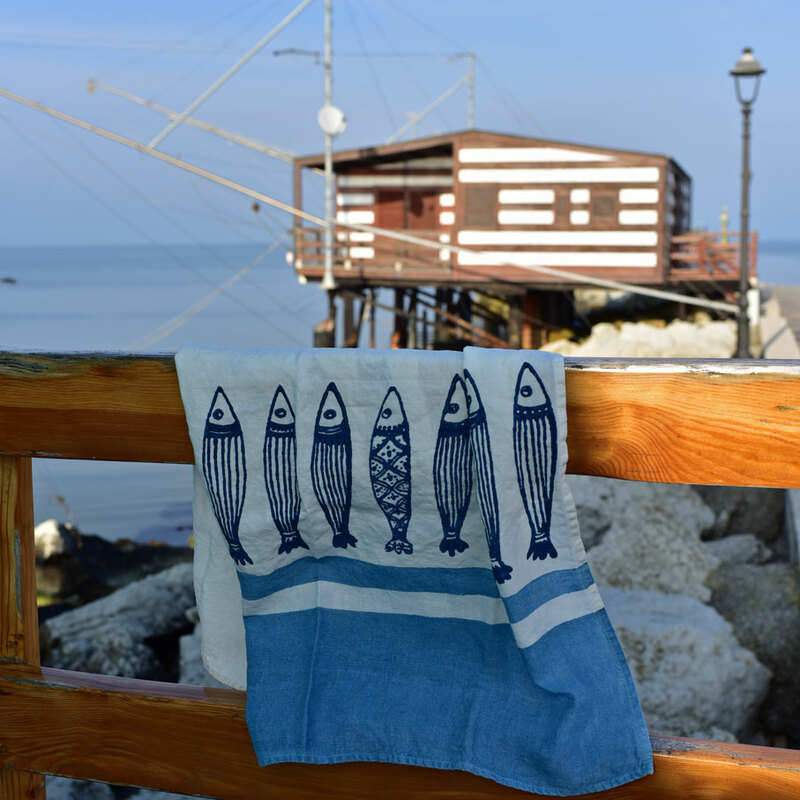 The crisp whites and rich blues of the ocean, the tranquillity and beauty of the landscape, the delicious fresh fish dishes and the wonderful tradition of the stampa romagnola style of printing on linen. Using only the finest organic linens, and the most refined paints; the block printing style offers a sharpness that perfectly complements the softness of the fabric. On the linen, the motifs have an addition charm. The fact that these designs straddle the worlds of tradition and modernity means that they are beautifully versatile. Whether your décor is rustic or contemporary, this beautiful range of home-ware offers the perfect design solution. It looks striking, unique and inspiring. It whispers of the ocean, of our culture, of our pride, of the beauty of Romagna and the freshness of the air and the seafood. It offers you a taste of Romagna and celebrates the richness of story that our home has to offer. 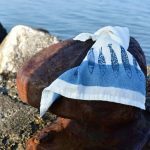 This entry was posted in News and tagged bertozzi, coastal, Coastal Style, Italian linen, linen, linen tablecloths, panarea, seaside home linens, Stamperia Bertozzi.